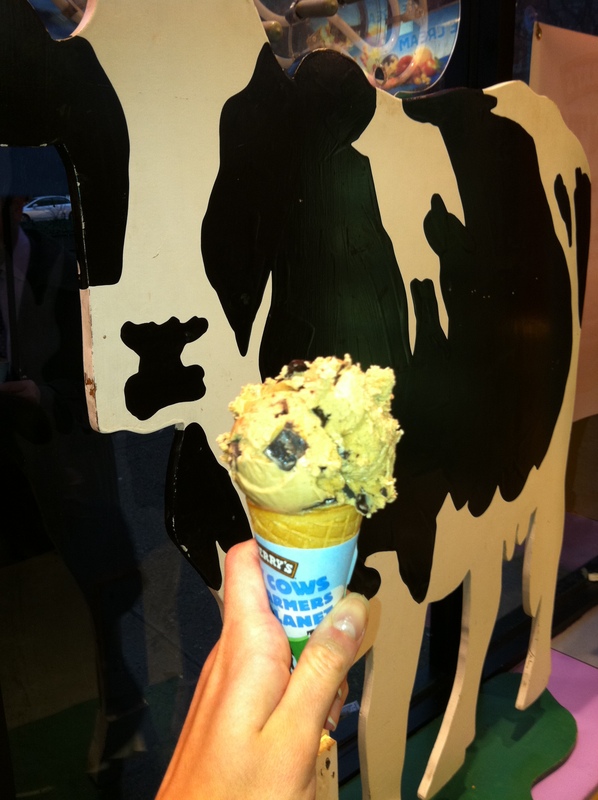 Ben and Jerry’s Free Cone Day! I found this quote the day I started my blog and have been saving it for a situation like this. Let me paint a picture for you. 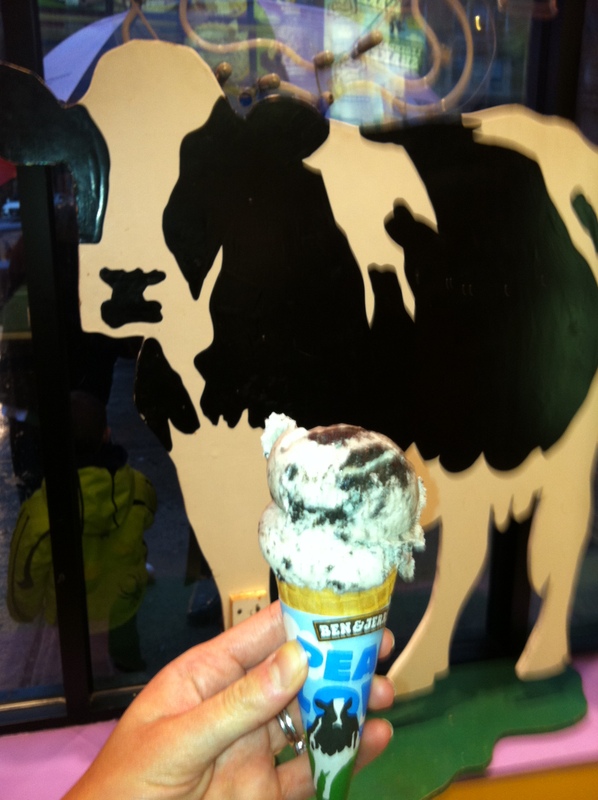 It’s pouring rain here in NYC today, but yet it’s Ben and Jerry’s free cone day. You know, the one day a year when they give out free ice cream, and the one day a year when a line longer than I care to think about snakes around the block. I figured the weather Gods were on my side, because obviously if it’s raining the line for free ice cream will be shorter. FALSE. I decided to be the bigger person and get in line. After all, I never pass up anything free, let alone ice cream! It’s a good thing I went because I made two friends and because I had two* free ice cream cones (*more to come about the 2 cones later). Good things come in pairs. While waiting in line I befriended a sweet mother and daughter duo. I started telling the little girl that I write an ice cream blog, and let’s just say her eyes lit up so brightly that her excitement was palpable. I think that’s the look of a kid in a candy store! The mother asked me if I am a food writer. I chuckled and told her that I work in global health, and here I am contributing to the obesity epidemic with this blog. Ohy. We both got a good giggle and proceeded into the the store (finally, a reprieve from the pouring rain). Bright eyed and bushy tailed, I went straight for the counter and ordered myself cone #1, sweet cream and cookies . I took one lick, paused, and gave the mother + daughter duo my blog address. The next thing I knew my ice cream was on the floor. I got so excited about broadening my readership that I lost the only thing that mattered to me today – my free ice cream! Enter cone #2. I marched right back up to the counter and asked for a replacement. This time, I decided to taste another ice cream (why not?) and ordered Coffee Coffee Buzz Buzz Buzz, a personal favorite. Let’s just say that good things come in pairs! Both ice creams were scrumptious. Perfectly creamy, yet firm, a good ice cream to mix-in ratio, and of course, scooped beautifully. These pictures don’t really do the ice cream justice, but you get the point: yum! Off to finish the Mint Milano Ice Cream… Stay tuned. Too bad we don’t have Ben and Jerry’s in Key West!